Over the course of the last decade or so, North America has seen a remarkable influx of games and series which, in the past, had been exclusive to the east. From Shin Megami Tensei to Fire Emblem, the widening acceptance of gaming in general has allowed for a much broader cross-section of Japanese gaming to be seen on our shores. However, there still remain a number of long running series which have yet to make the jump across the pond. Glory of Heracles, whose first game was released in 1987, is one of these, and although the game contains many elements that are carried over from earlier entries in the series, the fact that this is the series’s first international release works strongly in its favor. As with the rest of the game, the story of Glory of Heracles plays with traditional RPG cliches. The plot follows a silent, nameless main character with amnesia — nothing new there — who also happens to be immortal. In fact, all of the main cast will more or less come out and say when you first meet them that they’re never gonna die, can’t remember where they’re from, and are going to join the party whether you like it or not. The story takes a little while to get going, but it eventually takes up a number of elements of Greek mythology, from Pegasus to Daedalus, and blends them all together. Along the way, the story takes gentle swipes at a few of the more well-known cliches, such as stealing items from the houses of NPCs. The slightly snarky manner in which the game was written backs up this sense of fun, and the dialogue sneaks in a few well-placed references to, for example, the Legend of Zelda, and Kid Icarus. Spells can be boosted with a touch screen minigame, but they’re mostly unnecessary. On the whole, Glory of Heracles has a fun, if not particularly involving story. A large part of the cast’s motivation boils down to, “The Gods told us to do it,” a problem which generally stems from having a main party full of characters who can’t remember anything. With this much amnesia floating around, no one remembers if they even have any other motivation. Most of the main cast manages to flesh out reasonably well by the end of the game, though few if any of the secondary characters end up as much other than cardboard cut-outs. The plot itself is pretty loose, with no real overarching theme to tie the whole thing together, despite the abundance of potential themes in the mythological source material Glory of Heracles already draws from. The combat system is a fairly basic turn based system, with a few interesting ideas. For a start, each of the player characters are arranged on a two-by-five grid that sits opposite the grid occupied by the opponent. Since players can’t place two characters on the same Y-axis, the grid system ends up behaving quite a bit like a traditional front-row back-row system, with the less defensive characters in back and more physical characters in front. Characters take turns in order of highest agility, but with a bit of randomization. Generally, games that use this kind of turn order end up making it tough to make certain tactical decisions in combat, since the player is never certain when a character will get around to taking their turn, but Glory of Heracles gets around this problem by very simply telling players what order their characters will be taking. The game also has a few new ideas about spellcasting. For a start, spells not only consume MP, but also a substance called Ether, which is a sort of elemental MP determined by the battlefield combat takes place on. All spells either consume or create Ether, giving the player the ability to, for example, use spells that boost Earth Ether in order to cast a powerful Earth-elemental spell. It leads to some interesting tactical situations, especially when Ether Reflux, which causes damage to characters who try to cast spells without the proper Ether available, is taken into account. Players who find themselves up against a monster who uses nothing but Fire-elemental spells may find it wise to attempt to drain all the Fire Ether out of the playing field, forcing the monster to hurt itself when casting. Unfortunately, as with many elements in Glory of Heracles, the combat system is never really pressed as far as it will go. Thanks in large part to the prevalence of very powerful abilities, and the fact that players with fairly basic equipment can cause abilities to activate something like 80 to 90% of the time, the difficulty level pretty much falls down a hole in the second half of the game. Even the final boss provides little or no difficulty, which is always a bit of a letdown. One point of contention I have with Glory of Heracles is the interface, particularly menu setup. The biggest issue is that the menu is simply overcomplicated, forcing the player to tab between characters for the simplest of tasks and breaking up literally everything into its own separate category. One bright spot, however, is the game’s use of the touch screen. 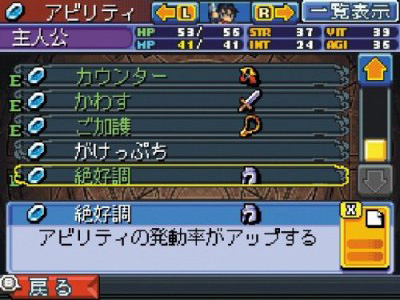 Though the menus themselves are not particularly intuitive, the touch screen controls are quite responsive, and even a little more useful in battle than the more traditional button controls. The music for Glory of Heracles was composed by Yoshitaka Hirota, with newcomer Yoichi Kanno. Most gamers will remember Mr. Hirota from the Shadow Hearts series, whose soundtrack is absolutely nothing like the work found in Glory of Heracles at all. Where Shadow Hearts used a creepy, often industrial soundtrack, the tunes of Glory of Heracles are all strings and horns and heroism. Overall, the soundtrack is fairly good, though hardly outstanding. The only real problem with the music is actually not the music itself, but the fact that every time the player gets into a battle, the field or overworld music will restart. 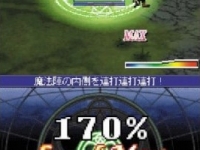 Given the game’s higher than average encounter rate, the first four bars of any given song will quickly begin to wear thin. Which equipment gives what abilities will be a major part of putting your characters together. Unlike many elements of the game, Glory of Heracles uses a transparently traditional visual style, save for the cel shaded characters themselves. Likewise, character design is fairly basic, which is a bit of a problem given that the greatest weakness of the visual style is its lack of detail. Bolder or more outlandish character design would have helped the cast to stand out more, as their dull appearances force players to focus on the faces, which are very basically rendered. 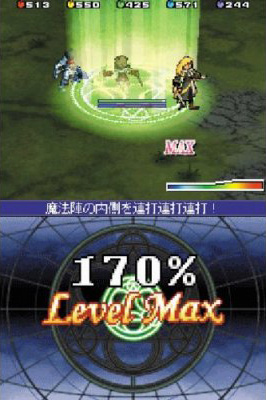 The game does use some interesting visual tricks to make certain scenes more dramatic and exciting despite the lower-powered hardware of the DS, allowing for some creatively-shot scenes late in the game. On the whole, the visuals are solid, but they have some rather significant underlying issues. With a moderate time to complete of around 35 to 40 hours, Glory of Heracles is a solidly-sized chunk of role-playing. Unfortunately, there really aren’t any sidequests to complete, and although the game offers some fun post-game tasks, such as a Golden Sun-style survival arena and a New Game+ feature, the fact that players are pretty much railroaded from beginning to end creates problems on multiple run-throughs. Perhaps thanks to its lack of familiarity in the west, Glory of Heracles comes off as a solid RPG that strikes a reasonable balance between the traditions of the genre and its own innovations. Though some of its ideas don’t quite work out, and the game’s desire to make cultural references does, on occasion, fall flat, Glory of Heracles tries pretty hard, and succeeds more often than it fails.